I first listened to the Wicked soundtrack in a Barnes & Noble music section one month before I graduated from high school. The musical will forever be associated with this time of my life and its general upheaval. But unlike the similar associations I have with Avenue Q (a show about the after-college lost year), for example, Wicked (a touring production performs at Paramount Theatre through Nov 17; tickets) has always felt much more juvenile–not in bad way. With a book written by the woman who finally expressed the joys of watching your crush lean against something, My So-Called Life writer Winnie Holzman, and the man with as many hits (Godspell) as misses (Working), Stephen Shwartz, the musical has always enjoyed huge success. By and large, this can be attributed to the subject matter: Feeling like an outsider and trying to make friends is a fairly universal experience, and kid-friendly to boot. 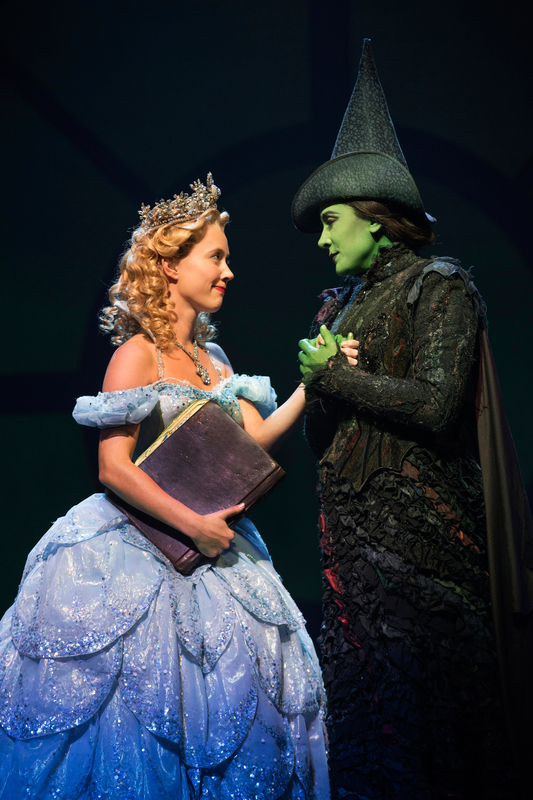 But as much as Wicked was trumpeted in its time as being a “brave new musical,” it never trod new ground. The story of Wicked, which I feel silly for laying out since it’s been relayed to me even by people who don’t go to theatre or know musicals, is the behind-the-scenes look at the Wicked Witch of the West. Think VH1 Before They Were Stars, only without a confessional. It follows the sisterhood forged between Glinda the Good Witch (here, Patti Murin) and Elphaba (Dee Roscioli) at college and carrying through their careers as perceived good- and evil-doers, respectively. This is all tied together neatly with a love interest in the misquoting-Socrates and general airhead, pretty boy Fiyero (Cliffton Hall). Fiyero gets it on with both Glinda and Elphaba, cheapening their story by turning their quest to define-and-do-good storyline into a “You stole my boyfriend!” catfight. I know. I know. It’s my fantasy and no one else sees it, but come on. “You’ll be with me like a handprint on my heart?” Serious dyke drama. But I digress. If there’s a negative for veteran watchers, it’s that the show really hasn’t changed much in the near decade it’s been alive. They are still using the beautiful set from Eugene Lee and the ridiculously colorful costumes of Hilferty (both designs won Tonys and with good reason). But the actors sing and dance, too, and that choreography and staging hasn’t changed, either; in this, the tour feels like a watered-down version of what Chenoweth and Menzel did a decade ago. That said, Murin and Roscioli own the show. Murin’s timing as the bubbly Glinda always entertains, and her growth from simpleton airhead with no other cares but herself into a public figure who cares about Oz and her only true friend is rendered beautifully. Roscioli’s dry and witty Elphaba contrasts wonderfully. The other performers are amazing in their own right (this ensemble is terrific, not one sour note), but it is a story about the two leads’ friendship and no one else can compete with their skills. Hoo boy. They have some pipes. Wicked (by design) doesn’t give much opportunity for anyone else to shine, comparatively. The Wizard, first performed by the amazing Joel Gray, is taken up by Tom McGowan. Unfortunately for Tom, all I could think was, “That’s the camp counselor from Heavyweights,” every time he came on stage. I’m sorry. I couldn’t help it. He was decent, though not much of a singer and his big reveal in the show did not have much emotional resonance. to be fair, that’s as much a problem with the script as with any actor forced to reprise “Sentimental Man” with a wavering voice. And, no, Cliffton Hall as Fiyero did not really do much for me. Though his voice was perfect, I did not feel that he was actually connecting with the two women in question. I just don’t think the chemistry was there. But the mother behind me did sigh deeply when Fiyero and Elphaba finished their OMG-Is-This-Song-Still-Happening duet. So maybe I just have no heart. Also, my favorite song, “No Good Deed,” sadly fell a little flat, though not because Roscioli didn’t hit every note perfectly–instead, because she did. This song is the best opportunity to showcase the pipes and belting skills of Elphaba, and is fraught with emotional weight and intensity. But Roscioli opting to make every note perfect, instead of getting into the guttural determination and fear that comes with the song made it forgettable. This is the third time Wicked has come to the Paramount since 2006. In fact, it’s come every three years. My biggest question going into it was, who hasn’t seen this thing, yet? Ask a silly question, I guess. I ran into a woman in the lounge who just kept repeating, “I’m so excited. I’ve never seen it before.” And then the woman behind me in the audience with her eight-year-old boy (who kept saying really hysterical things throughout the production) said at intermission that it was also their first time. And my companion had never seen it (and never seen Wizard of Oz, which is it’s own mystery). Why does Wicked continue to sell out houses? My best guess is that it’s a kids show. There’s no troubling, deeper meaning. The political unrest displayed throughout, though tongue-in-cheek, is kept from the forefront. How we categorize and demonize the “other” is similarly touched on, but not fully explored. The traumatizing disappearance of Dr. Dillamond is erased by his return, and the significance of losing his voice and the ability to speak is completely glossed over by ridiculous nothingness. Wicked dwells in that place where all we’re really thinking about is how dishy our girlfriend is, or “I can’t believe she just said that to me! I thought we friends!” There’s nothing inherently wrong with that, except when it prevents new musicals from growing up. You can talk about serious issue with songs, but you have to stop shoehorning in the same old love stories first.